I have Astro-TAC Receiver (conventional) and DIU3000 with IMBE firmware in it. Want to run this set ro receive Analog + P25. Yes, I remember that I will need audio PA to pump speaker and this is not a problem. 1. Which connection options I do have to link my ATAC and DIU? V.24? 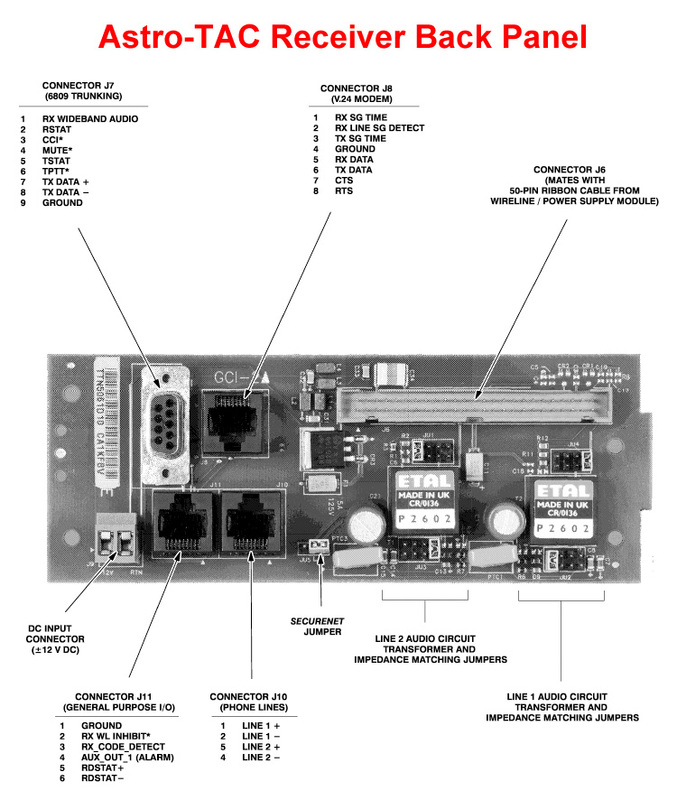 Astro 9.6 via optional modem board? Analog TRC line (STATION connector)? 2. What is the best way to interface them? They are located 20 feet away of each other. I can arrange UTP between of them. But there are some RF lines there also, and transmissions from portables are also possible. So I believe that digital link could be better. 3. How can I check, is Astro 9.6 kbps Modem Board installed in receiver or not? Receiver mounted in cabinet and I can't see its rear side. But I can read it via RSS. And see no any mentions about it or something similar. 4. Does DIU3000 support any modern deskset phone style remotes, like MC3000, or/and digital junction boxes, like L3208 / L3239? Or similar. Just I hate the idea to run something old and big, like T5600 or CENTRACOM Series II. 5. Whuch commercially available handset can be used as direct replacement to obsollette CDN6209 / CDN6209A? It must be with RJ11 connector. In general situation is funny. Looks I have tons of manual and papers for everything mentioned, but I can't find answers on my questions. Lack of expirience and education, yes. So, I need your help, guys. I believe the preferred way is V.24 & 4 WIRE. I do think that you can stick an Astro Modem in it but I am not sure. The key here is that for any DIU's in your system you must start at port 1 (or maybe it's 0 on those, I can't remember). If you plan to expand leave a port or two open before you start your receivers. You have to open the dang things and look at the boards. If you are good and know what your are looking for you might be able to cheat with a flashlight. Remember for the AstroTac Comparator you need two modems per card. You can not use v.24 and astro modem on the same physical card (at least from the factory - no idea if people have figured out some whacky mod. Off hand 4 wire only. Not sure if you can use others. I've been told maybe with ACIM you can do more channel steering than you can with tone but never made it work or attempted it. Thanks! The only unclear moment - what is the port0 or port1? Where they are? To clarify situation. Now I don't have comparator at all. I have only 1 DIU and 1 ATAC Receiver. No plans to expand system now. Just want to play with what I have. Ah, sorry, I was thinking you had the comparator......... oops! There is an Astro Tac Manual I believe over at repeater builder which would have the pinouts for the receiver and what port to hook up to. I do believe you need a v.24 daughter card in the RX'er but I'm not 100% sure - all of ours have Astro Modems today. I'd think you could simply take the output of the v.24 port and plug that in and match up the 4 wire and be good to go. But here is the problem. 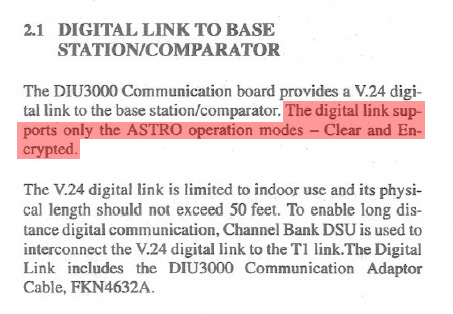 DUI paper says that V.24 link is for Digital modes only - clear or encrypted. No analog as I can see. V.24 & Analog = Hybrid (this requires two connections. One serial (syncronous HDLC), one audio (4 wire). This is where you see at remote sites (if you have been) the old school Paradyme or v.34 Motorola modems - they are converting the serial to an audio connection (which could be standard dial up telephone or 4 wire audio). Either way you need two paths to connect a hybrid site. Astro Modem = The modems (unless configured otherwise) talk to each other all the time. They stop for analog voice and then re-negotiate the datastream when done. So for P25 audio - you need to do a v.24 link from the receiver to the DIU, and for analog another cable which is your standard 4 wire connection. That's why it talks about two different links - it's a hybrid connection. Now someone else can comment here if you can hook the receiver right up to the DIU in this way - but this should get you some of the way there. 1. Why they recommend to use 2 wires for 1 signal line? 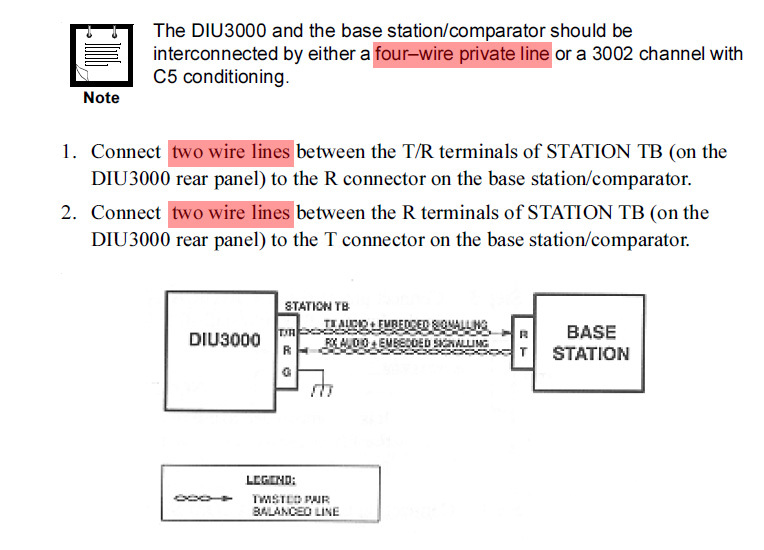 Do they mean that I must use 2 wires in parallel for TR, and 2 wires in parallel for R as well? Just to improve copper cross-section/to minimize loss or what? Because I see only 2 lines but not 4 (excluding GND of course). 2. Station connector at the rear of DIU offers 5 terminals, but not 3 as described (TR, G, R). Just 2 terminals are not described (marked with red). Shall I use them or just avoid? And the most important question, #3. Where is equivalent of "T" Base Station line on AstroTAC (signal that come from Receiver to "R" STATION terminal of DIU)? There is no green pastic connectors at receiver at all, but only RJ48 and DB9F. And I see no any lines what looks like T/R or R.
Answering my question by myself. J8 is your v.24 serial connection. J10 is your 4 wire audio connection. Orange Pair (orange & orange white) is RX audio from the DIU and the Blue Pair (blue & blue white) should be the audio from the Astro Tac to the DIU. I also thought about J10, but still not sure. Because manual describes J10 usage is only for landlines (and once for phone lines). But not leased (dedicated) lines. If I use J10, I must know jumper settings for impedance match (JU1/JU3 and JU4/JU2). Which one I must use? 1, 2, 3 or 4? Or maybe remove jumpers at all (manual recommends to remove jumpers for high impedance I/O)? Also I think that JU1000 must be set to the right position when ASTRO-TAC seen from the front panel. It will mean 4-Wire. JU5 must be in right position (when seen from the back of ASTRO-TAC), what means non-SECURENET mode. And thanks for TIA B colors. I will doublecheck anyway. Jumpers I am not in a place to help with - whatever came out of the box has worked. I would assume (and stupid me for doing so) that they come programmed for 600 ohm termination. The other settings might be 300/900 depending on if it's bridged in with other equipment. Keep in mind when the Astro Tac was designed it was done for phone lines (e.g. FDDA / DS0) style circuits and that's basically what people would use. Doesn't mean it needs a physical phone line. Thanks for your help. Finally got it working in V24 HYBRID mode. But come across with a small problem. When I transmit in P25, I hear very load buzz in local Astro-TAC speaker. Buzz sound like modem. But at the same time in DIU headset I hear clear P25 audio. This is not a problem of links, the same happens when both links physicaly removed. So, this is internal Astro-TAC issue. Or it's ok? Astro-TAC don't know what to do with P25 and transfer datastream to speaker. Here is how it sounds. These are just P25 conventional PTT presses. I happens when Channel is Analog/Astro CAI capable. When I transmit in P25, I hear very load buzz in local Astro-TAC speaker. Buzz sound like modem. So we have to think of the role of the DIU in this case. The DIU is there to do a few things. It is the gateway between the analog console world and the astro signaling/audio world. The DIU can take console keying tone commands and send signals over V.24 serial (or via Astro Modem) to the end devices (Quantar, Quantro, etc). The Quantar/Quantro/AstroTac RX have no ability to actually decode or interact with anything digital. They listen, likely do some error correction, and dump the data bits down the pipe to the next device (comparator, DIU, etc.) in the case of a digital transmission. Those devices then do something with it. So if you listen on the speaker you are hearing a representation of what the station is hearing but not demodulated/recovered digital audio. That's the DIU's job. Totally agree with you. I know that Quantar doesn't have any DVSI/IMBE software inside. So, nothing to do with P25 received (excluding the error correction as you stated above). But it’s strange why it sounds not as APCO25 CAI in analog and changes tone/volume with every new PTT. Strange. Anyway, this situation can be solved by changing Channel type to Asto CAI (but not Analog capable). Also, channel can be Analog/Asto CAI, but you have to set any PL/DPL to prevent buzz sound when you do P25. But here is some funny thing or bug, I don't know. Receiver must be set to SQL mode by keypress from local panel (but not RSS Status window!). You can cycle receiver's mode between SQL/PL/Off, but when you do that remotely from RSS, it works not as expected. In PL mode local receiver actually remains in SQL mode – you will hear any carrier from local AstroTAC’s speaker, but DIU will remain muted! But if you change mode by keypress from local panel (physical button), local receiver will keep silence also until get proper PL/DPL. Funny appearance! Excluding the thing that I spent a few hours before figuring this out. There is a local operation and wireline operation. The audio you hear out of the station is considered flat without any deemphasis. If you were to hear the same on a portable radio it will sound different due to the portable processing the Astro into clear audio with de emphasis. Thanks for info about local control and WL control. It's new info to me, I've never seen it before in manuals. About the buzz. No, it's not a question of emphasis. I am familiar with APCO during 10+ years and I hear it without de-emphasis. Signal I hear from Astro-TAC is something totally different from C4FM. And C4FM doesn't change tone with every PTT. So, it's something else processed by Astro-TAC. May be demodulated or related to V24. It's easy to check. Just take any Motorola radio and turn de-emphasis off. It's easy. And P25 (C4FM) will sound like with de-emphasis enabled, but just with a bit different frequency response.